I feel like every week the recipes keep getting better and better!! 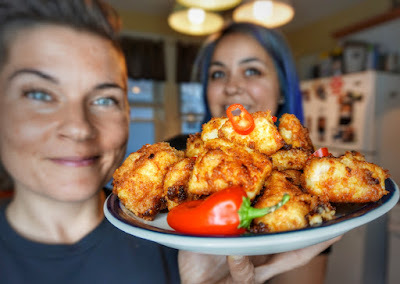 This week we found the BEST keto general Tso's chicken recipe over at Ruled Me. I feel like we could open a restaurant with things like this on the menu!! Fry up some cauliflower rice for a side and we have ourselves a pretty badass dish! Place about half a bag of pork rinds in the food processor. Pulse them until they are a fine and ground powder. Remove the pork rind dust from the food processor and put it in a bowl. Add your almond flour and mix it well. In a separate bowl, scramble 2 eggs for dipping the chicken in. Clean off your chicken breasts, getting rid of any fatty or gritty parts. Cube your chicken breasts, trying to be as uniform as possible. Now get your station ready. Dip the chicken into the egg, dip it into the pork rinds and almond flour, and then put them off to the side to get them ready for frying. In a pan, heat up 1 Tbsp. Olive Oil and 1 Tbsp. Coconut Oil. Once it is hot, add your chicken to fry. Continue frying them, flipping them over when needed to create a crust. You don’t want to cook them all the way through here because we’ll be cooking them in the oven later. Once they are finished frying, transfer them to a baking tray. I do about 2-3 batches of frying before I’m finished. Overcrowding the pan will allow too much of the oil to be soaked up and create a soggy texture. Add more oil to the pan as needed. Let’s get started on the sauce. Add all of the ingredients into a bowl. Mix it well until thoroughly combined. It should have a dark red color to it. Cover your fried chicken cubes in the sauce. Mix the sauce and the chicken well, but being careful – you don’t want the batter to peel off. Put the chicken in the oven for 60 minutes. Every 15 minutes you’ll be taking it out to flip the chicken. After 15 minutes there should not be much change, stir the chicken and make sure every piece has sauce. After 30 minutes you can see that the sauce has started to thicken. Continue to mix the sauce and the chicken, flipping the chicken pieces of needed. After 45 minutes you see that it’s almost done. Flip the chicken and cook another 15 minutes. After the one hour is up, the sauce has become thick and rich. Serve as you see it now, without mixing it, to give a nice sauce crust on the chicken. This makes about 3 servings at 1.4 pounds each, depending on the size of chicken breasts you use. At 3 servings, it came out to: 566 Calories, 37.3g Fats, 4.5g Net Carbs, and 59.3g Protein.